Apple’s iPad mini will always be special to me for a few reasons. 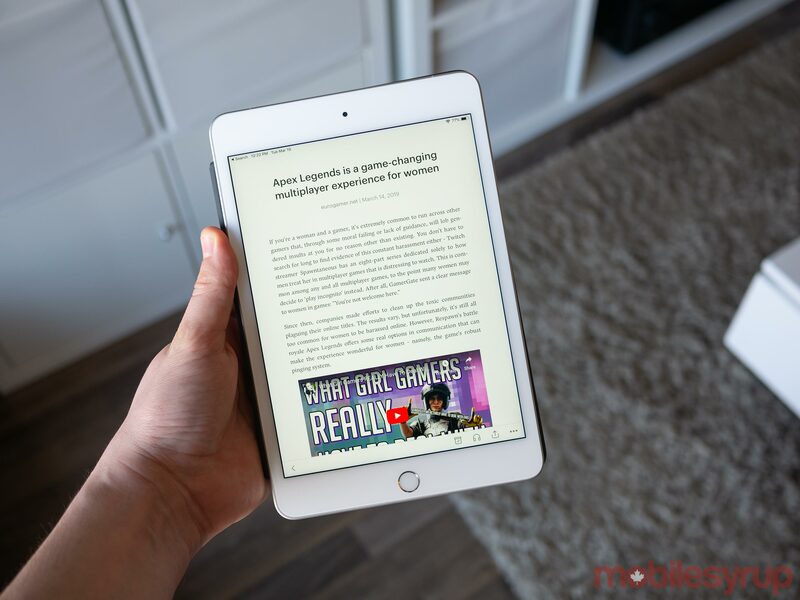 The iPad mini 4 is not only the first device I reviewed when I started at MobileSyrup, it’s also the best iPad size for reading and playing mobile games, as far as I’m concerned. Fast-forward to 2019 and against the odds, Apple has refreshed the iconic mini with new internal hardware. While the processor upgrade is worthwhile, the tablet looks identical to 2015’s iPad mini 4. As a result, the overall design feels somewhat dated, especially when compared to the iPad Pro (2019), which features both USB-C and reduced bezels. Then there’s the whole argument regarding the iPad mini’s 7.9-inch display size compared to the 6.5-inch screen featured in the iPhone XS Max. Does Apple need to sell a device with a screen that is 1.4-inches larger than its biggest iPhone? Probably not. With that said, I’d argue this isn’t the right way to look at the iPad mini (2019). I view the tablet as a companion device, similar to other versions of the iPad. 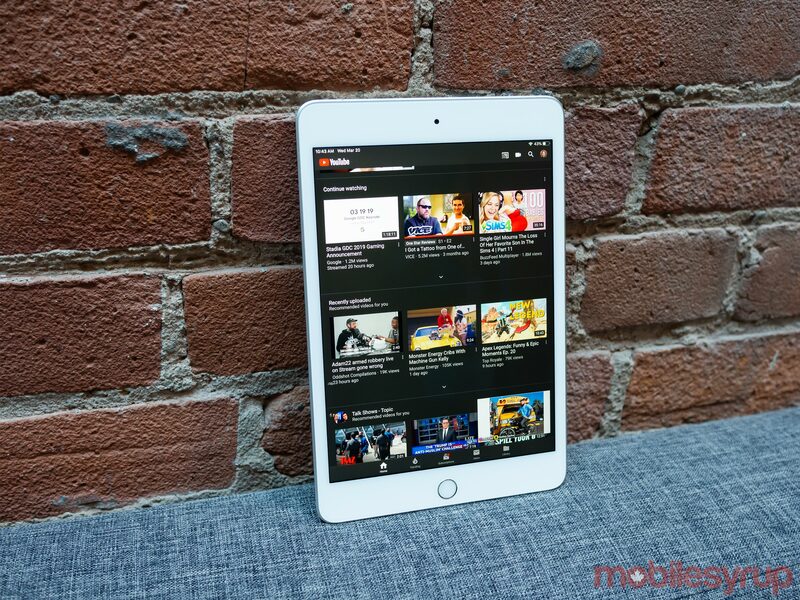 It’s for people who want to watch videos on YouTube, read long-form articles with Pocket, or browse the internet on a tablet that is larger than their smartphone. They aren’t interested in doing work with the iPad mini, but still want a device with a screen more expansive than their handset’s. The mini could also give Android users a more affordable way to dip their toe in Apple’s iOS operating system. In a world where Android tablets really don’t exist in a meaningful way anymore, Apple’s pint-sized iPad mini stands in a league of its own. It’s also worth pointing out the $529 2019 iPad Mini tablet is $100 more expensive than Apple’s entry-level 9.7-inch iPad. 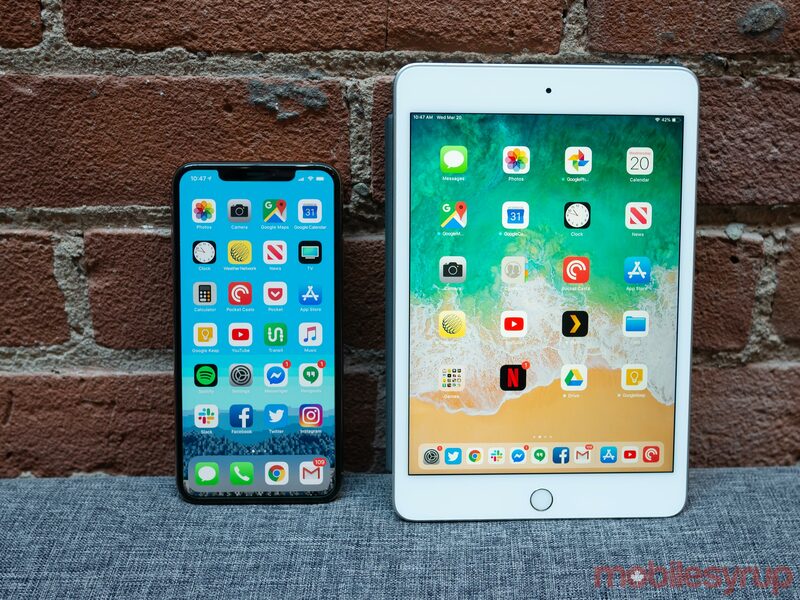 While this is undeniably a downside to the tiny tablet, especially if you prefer the larger 9.7-inch screen, the mini does feature a more powerful processor. Regarding the iPad mini (2019)’s specs, the tablet features a 7.9-inch 2048 x 1536 pixel resolution LCD screen. Though the display itself looks nearly identical to the iPad 4’s display at first glance, there are a few upgrades under the hood. For example, the new iPad mini’s display features a brighter screen, a P3 wide colour gamut and more importantly, Apple’s ‘True Tone’ technology. This allows the tablet’s screen to adjust its white balance to the ambient light surrounding it, making it much easier to look at the mini for long periods and under varied lighting conditions. True Tone works just as well with the iPad mini (2019) as it does with Apple’s other devices, including the recently released iPad Pro and MacBook Pro (2018). Overall the iPad mini (2019)’s display is also more vibrant than its predecessor’s screen. 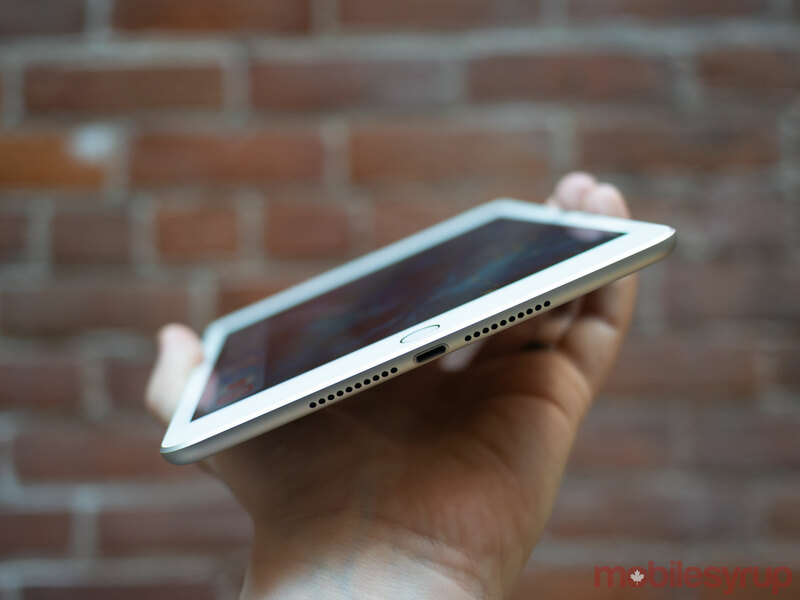 Also, given its small size, the screen features the highest pixel density of any iPad, coming in at 323ppi. Although I’m generally impressed with the new mini’s screen, it also lacks the ProMotion 120hz refresh rate featured in Apple’s iPad Pro tablets. This makes a significant difference regarding the blur that appears on the display when navigating iOS. 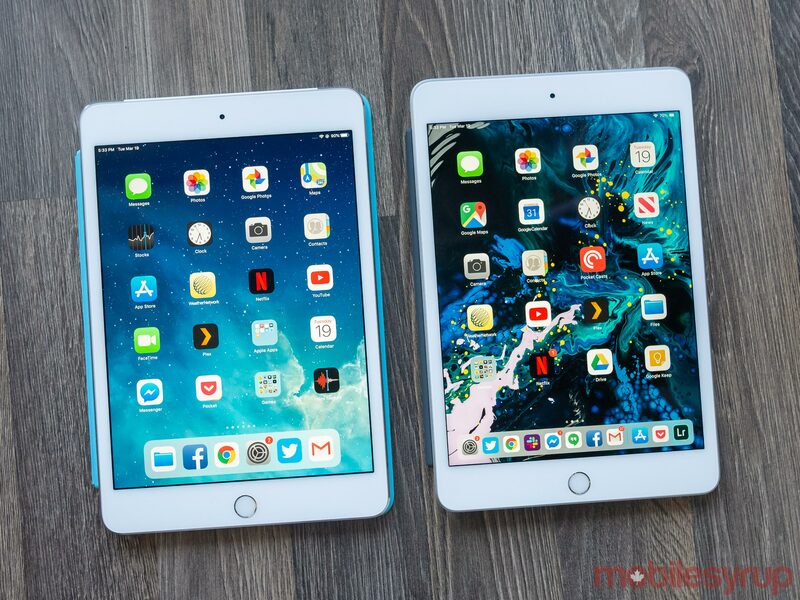 There are downsides to the mini when compared to the refreshed iPad Air (2019). For instance, Apple’s tiny tablet doesn’t feature a magnetic ‘Smart Connector.’ Because of this, the tablet is only compatible with Bluetooth keyboards. As a result, if using a keyboard with an iPad is something you aim to do, it may be worth picking up the new 10.5-inch iPad Air (2019) instead. Dimensions wise, the iPad mini (2019) comes in at 6.1mm and 203.2mm x 134.8mm x 6.1mm (8.0-inches x 5.31-inches x 0.24 inches). Furthermore, the new mini weighs 0.29kg (0.66lbs). To be clear, these are the same dimensions as the iPad mini 4. Any way you look at it the mini is a tiny, light device I hardly notice in my bag. Though Apple’s other iPads aren’t that weighty to begin with, the mini takes this to another level. 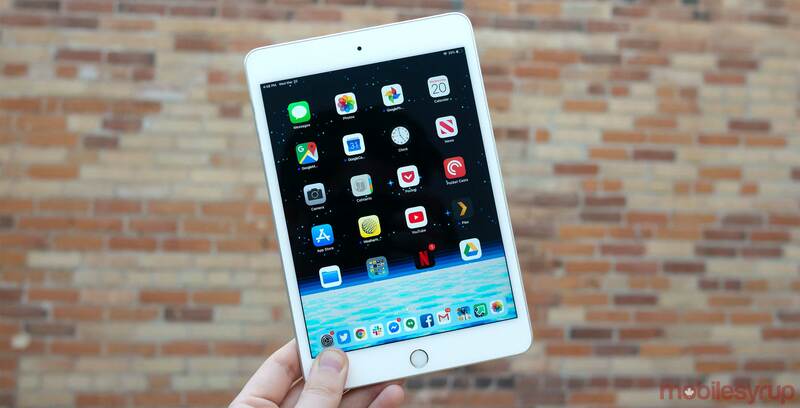 The most significant change with the new iPad mini is the tablet’s A12 Bionic chip, the same processor featured in the iPhone XS and iPhone XS Max. This is a massive step over the iPad mini 4’s rapidly ageing A8 chip. Unsurprisingly the result is impressive benchmarks, with the new mini sitting even above the iPhone 8 or iPhone 8 Plus in terms of Geekbench score. In total, Apple claims the new iPad mini is nine times faster than the iPad mini 4’s A8 chip, and as far as I can tell this statement seems accurate. 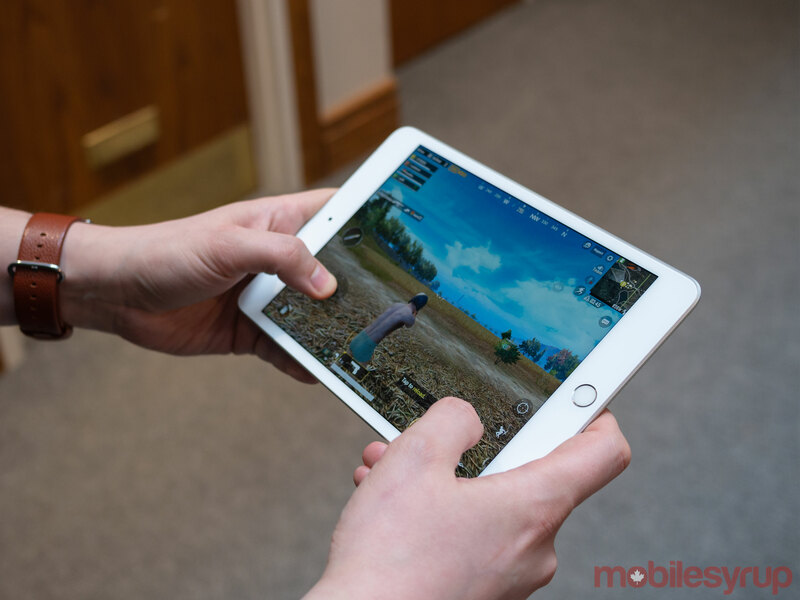 Though I haven’t spent a lot of time pushing the iPad mini (2019) to the limits, it handles everything I’ve thrown at it with ease, including editing photos with Lightroom CC and playing graphically intensive games like Fortnite or PUBG Mobile. In fact, because of the iPad mini’s smaller size, I found it easier to play games with, just like I did with the iPad mini 4. I spent a fair amount of time bounding over mountains in Alto’s Odyssey. Other hardware upgrades over the iPad mini 4 include Bluetooth 5.0, Gigabit LTE and even eSIM support. eSIM support is a great addition to the tablet if you plan to use it on the go as a secondary device. Of course, the iPad mini (2019) also features a Lightning port and not USB-C like the most recent iPad Pro, as expected. My main issue with the mini is it looks old. Apple’s design direction has moved on from chunky edges and Touch ID to the far sleeker looking minimized bezels of the iPhone XS and latest iPad Pro. It even took me a few minutes to relearn how to navigate iOS with a physical home button after getting used to Face ID and iOS 12’s gestures with the iPhone XS and iPad Pro (2018) for the last few months. The most significant change with the new mini is the inclusion of Apple Pencil support. Similar to other iPads I’ve used in the past, I don’t have much use for the stylus. I’m not interested in taking notes by hand, and I have no artistic ability. However, I snap a lot of photos and have switched to using the 12.9-inch iPad Pro as my primary image editing device. 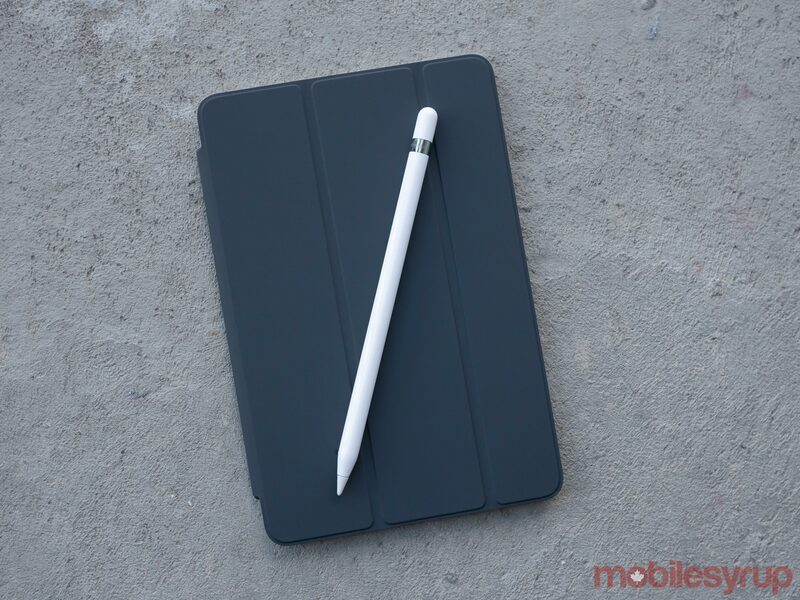 With this in mind, I made an effort to edit photos for this review with the iPad mini and the first-generation Apple Pencil. While it’s possible to do this, the experience wasn’t exactly ideal. The iPad mini’s 7.9-inch display is just too small to move Lightroom Creative Cloud’s various dials and switches easily. Spot editing also remains a difficult task on the mini’s 7.9-inch display. It reminded me up editing photos with my iPhone XS Max, a device that measures in at just 1.4-inches smaller than the iPad mini. This brings me to probably my biggest issue with the new mini. As someone who uses an iPhone XS Max regularly and prefers larger phones, I find it difficult to justify carrying around the iPad mini just for the tiny amount of extra screen real-estate. Of course, this is because I’m primarily an iOS user and also own Apple’s largest iPhone. Those not in this situation could find the mini fits better into their life. 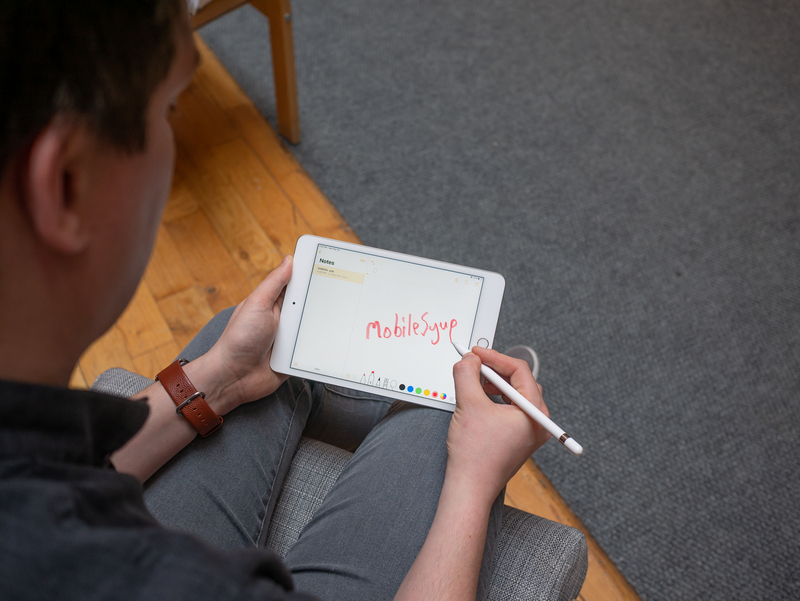 It’s also worth mentioning anyone who aims to use the mini for sketching or taking notes also likely won’t run into this issue as the 7.9-inch screen offers ample real-estate for those tasks. I really like Apple's iPad mini (2019) and I'm glad the tech giant opted to upgrade the device's internal hardware. All things considered, I can't help but wish it looked like a smaller iPad Pro, rather than the rapidly ageing iPad 4. There's also the question of price in the Canadian market, with the new mini coming in at $529. This is still cheaper than the new $649 iPad Air, but also more expensive than the standard $429 iPad. However, you do get more for that price tag in the processor department since the mini features an A12 Bionic Chip rather than the standard iPad's A10 Fusion processor. 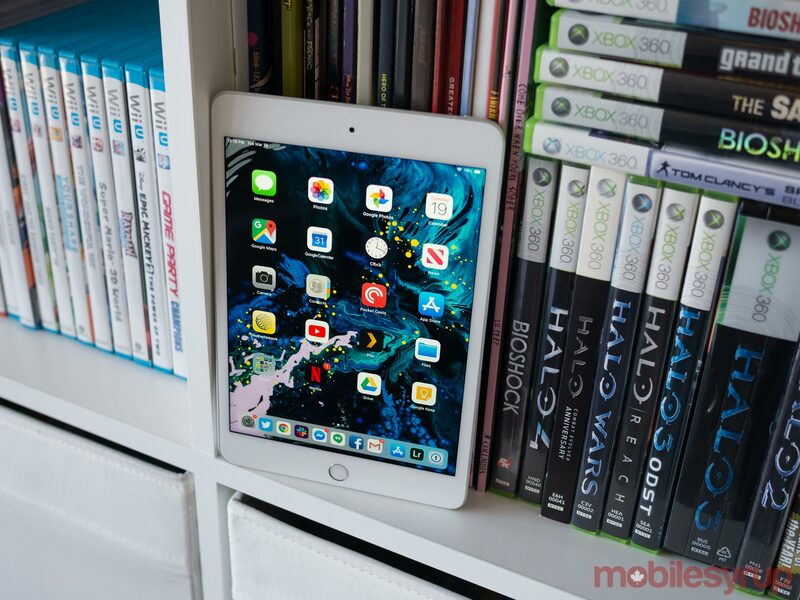 Still, some people may value the 9.7-inch iPad's ample display size over the 7.9-inch iPad mini's screen. As a result, I'd argue the iPad mini's audience is somewhat limited. 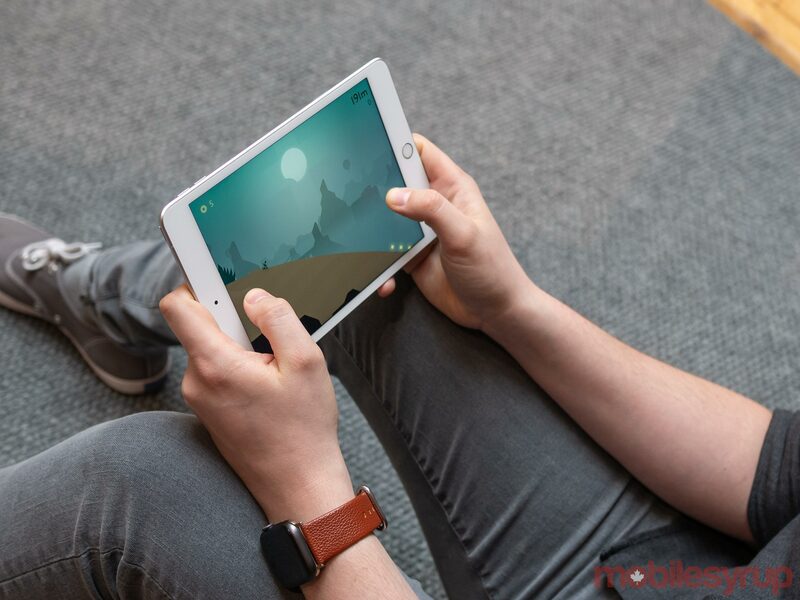 The tablet is perfect for a subset of users interested in using a tablet for reading, watching videos and maybe some light web browsing and note taking, but that also own a substantially smaller smartphone they carry around with them on a daily basis. "For a very specific demographic, the new iPad mini (2019) could be the tablet they've been waiting for"